Every other day there are Team Leader meetings held in the morning. These are an opportunity for the organizing committee to share information as well as hear from team leaders if there are any questions, requests or complaints. Mike tells me that as the days/weeks go by these meetings become shorter and less frequent as issues are resolved and things start ticking over like a well oiled machine. 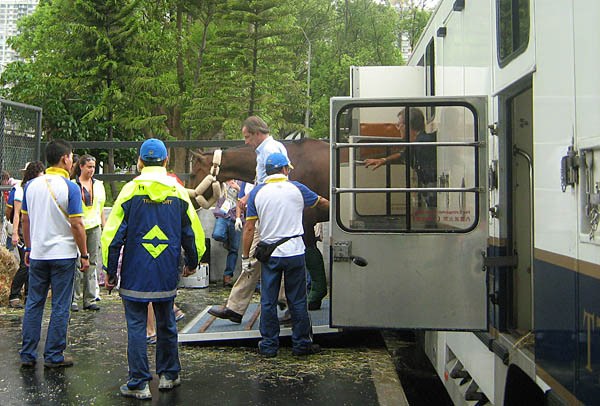 With the venue being as incredible as it is, and horse transport from the airport being extremely efficient, there are not too many issues that are raised. 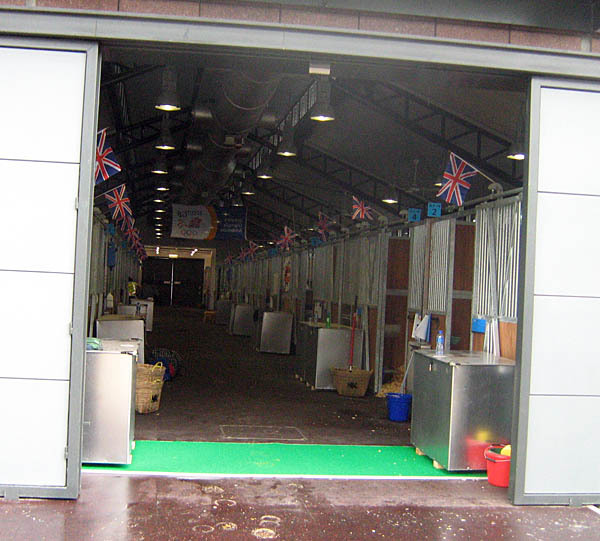 Leo Jeffcott, who is the Veterinary Commission’s Foreign Veterinary Delegate commented that in the 6 Olympics he’s been to that there have never been such good facilities. This is something that you hear pretty much everyone saying. The meeting covers items such as hours of operation for the dining areas, training hours for the indoor arena and the outside arenas etc. The news everyone was waiting for was the opening of the main competition arena. Over the next few days it will be open to the Eventers and the Dressage riders so they can start to get their horses used to the area. The organizers explained that the arenas are open until 9pm at night but the question was quickly raised as to whether this can be extended until 11pm at night. It doesn’t start getting dark here until about 7:30pm, and the majority of riders are eager to train under the bright outdoor lights since most of the competitions will take place until the evening running until 11pm or later. I suspect that the organizers will likely grant this request and likely extend the ‘quiet time’ in the afternoon to be for a longer period to compensate. ‘Quiet Time’ is when there is to be no riding/training. 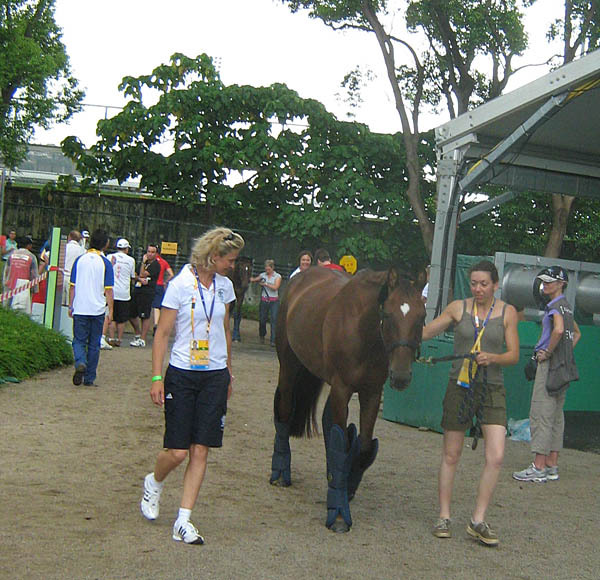 The FEI stewards want to ensure that rest time is built into each day to allow horses to relax. Right now it takes place from 12pm – 2pm every day. A topic which gets continuous attention is the weather. In the week I’ve been here, it hasn’t been too bad and today is actually quite nice. There was a presentation made by the Hong Kong Observatory where we were explained the differences between amber rain, red rain and black rain. Amber rain is what we would typically experience back home. Red rain is ‘cats and dogs’ and from the description of black rain it sounds like ‘elephants and rhinos’. Needless to say, if there is black rain they advised that the competion would stop immediately. 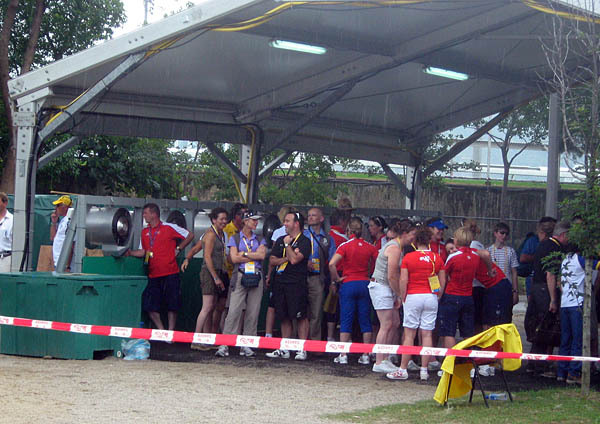 The HK Observatory have also installed a lightning sensor at the Shatin venue as well as at Beas River where the cross-country will take place. 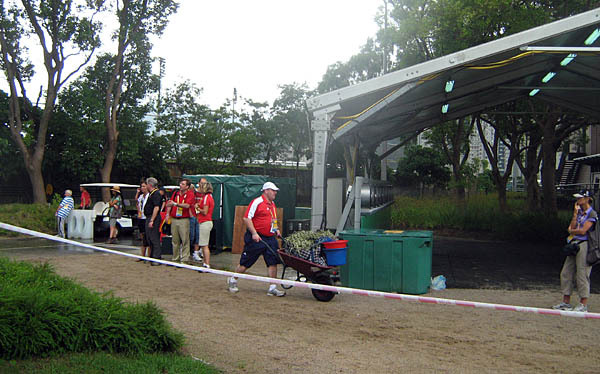 The sensors will help them detect if lightning is in the area so that the necessary precautions can be taken. The level of organization and expertise is quite impressive and certainly gives you the feeling that you’re in good hands. Since there are only one opening ceremonies, those being held in Beijing, Hong Kong organizers have put together a Welcome Reception on the same day for those who are not travelling to Beijing. This will include a mini team parade where 2/3 athletes or reps from each country will march behind their country’s flag. There will also be a live broadcast of the Beijing ceremonies on a huge tv screen for all to enjoy. 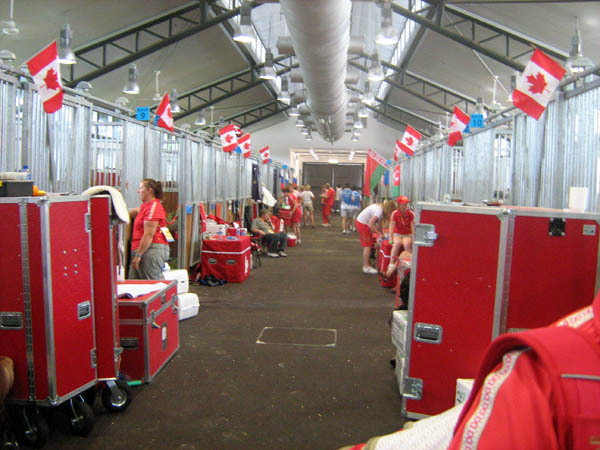 The Canadian event and dressage horses continue to do very well. The Eventers are now into a regular training schedule as they are the first ones to compete (their jog is August 8th with dressage being on the 9th and the 10th). 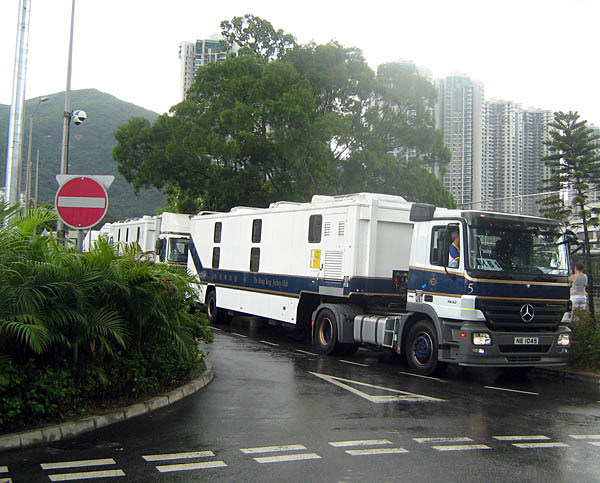 The incredibly efficient and expert handling of the horse transport has everyone raving with compliments. Managing Director Martin Atock of Peden Bloodstock is hands on throughout the whole process. wow, Im so jealous. This would be an amazing experience. I look back here every day waiting for updates!! !